Last year I bought a second-hand spinning wheel from a local charity shop and with it came a rather ancient rigid heddle table loom. Eventually I decided it was time to start learning how to weave. With the help of a U-tube video clip, my husband and I managed to warp up the loom and so we embarked on our first weaving project. As I never want to spend time making something for which I may have no practical use, I rejected the advice to start with something small, like a table mat, and decided we would weave a scarf. 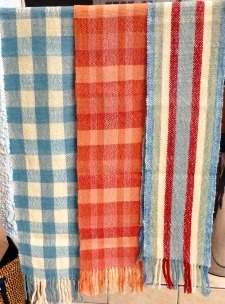 Rather ambitiously, we decided to use several colours in both the warp and the weft and to aim for a checked pattern. We also started off using cotton, as we had inherited a large quantity of mercerised cotton in a variety of attractive colours. My husband is holding our first scarf as it came off the loom, with the rows of waste yarn still in place. Of course the edges are not completely straight and the colour changes not made perfectly, but I have to say we were quite pleased with our first efforts and felt inspired to continue weaving. The photo below shows our latest efforts, this time using naturally-dyed wool, some of it handspun. The colours are from woad, madder and fungi.